On Thursday’s NewsHour, we’ll feature an excerpt of the film “We Still Live Here,” which tells the story of the return of the Wampanoag Indian language, the first time a language with no native speakers has been revived in this country. It’s part of our series, in partnership with The Economist magazine, showcasing the art of filmmaking. Jessie Little Doe Baird, a Wampanoag linguist whose story is central to the film, recently won a MacArthur “genius” award for her unprecedented work in bringing back her people’s language, which had not been spoken for over a century. 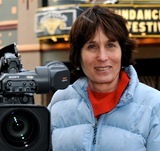 Anne Makepeace has been a writer, producer, and director of award-winning independent films for more than twenty-five years. “We Still Live Here – Âs Nutayuneân” is her most recent documentary, and is now making the festival rounds. It has won the 2011 Inspiration Award at the Full Frame Documentary Film Festival and the Moving Mountains Prize at Telluride Mountain Film Festival. > Growing up in Connecticut, I had no idea that there were still Native Americans in New England. Like all Americans, my family celebrated Thanksgiving every year, eating a lot of turkey and giving thanks to the Indians who helped the Pilgrims to survive, but I never knew the tribal name of these Indians — Wampanoag — or that they still lived on their ancestral homelands. Then in 2006, I was asked to produce Part 1 of the PBS series “We Shall Remain,” which centered on the fraught and ultimately disastrous relationship between the Wampanoags and the English who settled in their territories. I discovered that the Wampanoag were very much alive and well, living in several communities on Cape Cod and the island of Martha’s Vineyard. I plunged into archival research and spent time with people in these communities. When I met Jessie Little Doe Baird, the astonishing linguist featured in “We Still Live Here – Ã‚s NutayuneÃ¢n,” I was astounded by what she and other members of the Wampanoag Language Reclamation Project were doing. Their last fluent speaker had died more than a century before. With Jessie’s leadership, they were bringing their native tongue back as a living, spoken language. I was profoundly moved by this story and by Jessie herself, who never ceased to amaze me with her earthy humor, her loyal friendship, and her fierce dedication to the work of reviving the language. When I was finished my work on “We Shall Remain,” I began to think abut how I might make my own independent film about the return of Wampanoag language. This was a complicated issue; Jessie and other members of the Wampanoag Language Reclamation Project had a strict policy of never allowing their language to be used in anything that could be sold. They had refused many requests by teachers, filmmakers, and writers for translations and use of the language, because they want to nurture the language and keep it to themselves, at least until they reach a critical mass of fluent speakers. And it was further complicated by my own family history. My Makepeace ancestors were Puritans who came to the Massachusetts Bay Colony in 1635. One of my direct ancestors took part in the Great Swamp Massacre during King Philip’s War, a devastating conflagration that decimated Native people in New England in 1676. Four years later, the documentary is done and out in the world. It is a story of Native Americans taking charge of their history and their identities, reaching back to the words of their ancestors and forward to their children’s futures. My hope is that Native Americans and indigenous people around the world whose languages and cultures are endangered will take heart and renew their efforts to revive and revitalize their Native tongues, so that this country and this world retains its rich and infinitely varied cultural diversity. I would also like every American to see this film and acquire a deeper understanding and a greater awareness of the Indian people they celebrate at Thanksgiving every year, and of the unique and diverse histories and cultures of Native American communities living in our midst. “We Still Live Here” will air on Independent Lens on November 17. (Check local listings).